Renton Christian School provides music opportunities for all of it's students, including Kindergarten and pre-kindergarten who receive general music instruction from Mrs. Krogh. Choir is part of general music instruction for grades 5 and 6. 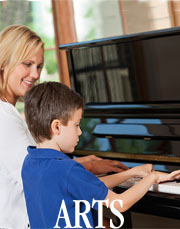 The RCS Music Program puts on two major concerts during the school year in addition to other music events. (Concert participation is part of the students' grades.) For additional information about all the music programs, you may contact the school office. Theater Class is a wonderful opportunity for students to express themselves through drama and music. It is also a wonderful way for parents to become directly involved in a fun, school activity by helping with sets and costumes, etc. and to earn SOS hours. To learn more about our upcoming drama and how to get involved, please contact Jenna Hanson at jenna.hanson@rentonchristian.org.